Well, I finally got the music blog up and running. 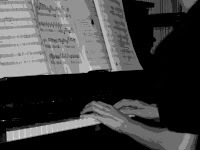 From time to time, I'll put up newly composed music for your listening and downloading pleasure. All of the music is free for you to use and listen to however you please. If you decide to use something in a project of your own, at least let me know how it turns out. I decided to use music selections from Alpha to get things rolling. You can either go back to my blog profile and follow the link there to the music blog or just click below. Listen. Enjoy. Don't let them get to your mind...it's the last place on earth you can hide.